Whilst Mercedes-Benz work, tirelessly, to improve the fuel efficiency of their products they also ensure the sportiness preferred by so many is acknowledged. 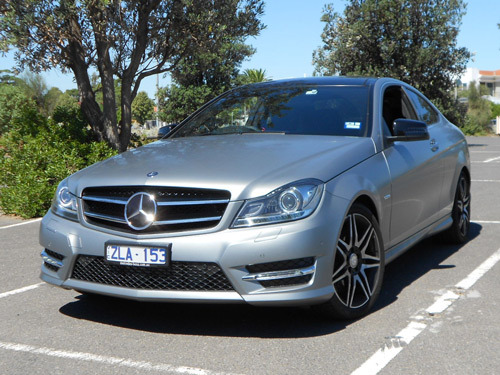 The C-Class models provide sufficient evidence should it be required. From the most frugal to the most threatening, such as the 6.2-litre V8 powered C 63 AMG, the Stuttgart based German manufacturer has all bases covered! 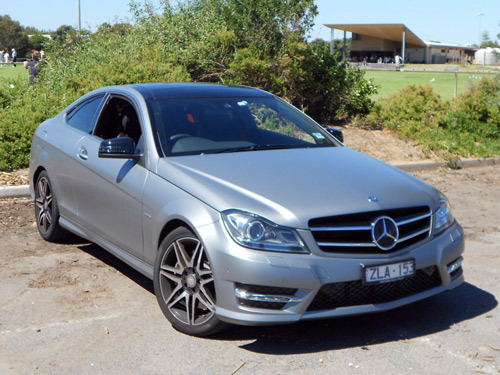 On this occasion, our road test car is the overtly sporty looking Mercedes-Benz C 250 Sport Coupe. 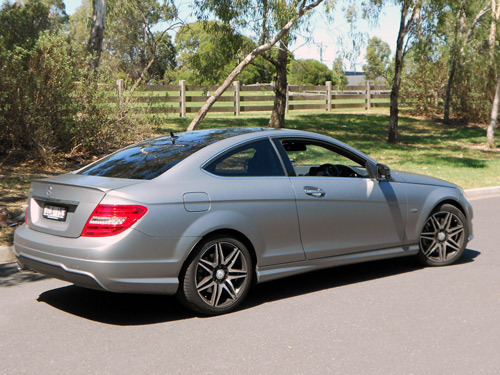 Looking flash in its 'designo magno Platinum Silver' paint job, this C-Class is no ordinary mid-sized coupe. Additionally, the C 250 Sport Coupe has had the AMG magic wand waved over it. Starting at $78,550* without options, the C 250 Sport Coupe doesn't come cheap. However, the test car was 'loaded' with options which made the starting price look good. Firstly, the flashy paint job is one of the options fitted. It comes at $5,990*. Wow! But it sure does look good. Then there's the Vision Package $5,340* and the Driving Assistance Package PLUS for $4,990*. But there's more! 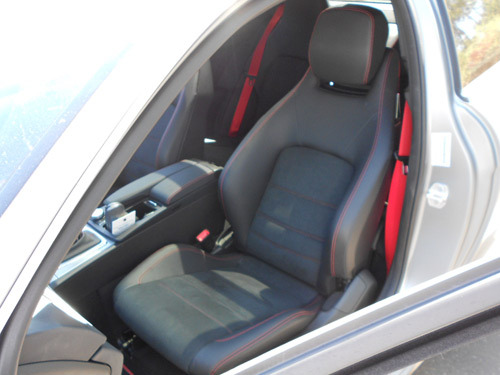 The test car also had the Comfort Package which costs $3,600*. As you can see, the starting price plus options can soon add up. In this case, the attractive C 250 Sport Coupe costs $98,470*. No wonder we enjoyed it! Power won't thrill you too much in the C 250 Sport, but it is pleasing for a 'downsized' type engine. The 1.8 litre petrol-fuelled engine is surprising though because on paper you underestimate just what is on offer. Really, I have to say that this engine, although small, will move you along quite well unless you're a thrill seeker. My advice is don't be put off by what the specs look like on your screen (or on paper, as it used to be). The ride is good and the steering is sharp, making for an enjoyable experience. Blind Spot recognition is a valuable driver assistance system. Mercedes-Benz call it "Active Blind Spot Assist" and as it was fitted to the test car (as part of an option pack) we can attest to its compelling attraction as a safety feature. Sensors recognise when a vehicle is in your 'blind spot' (mostly). If it becomes a more common fitment to vehicles then I believe that would be a good outcome for road safety. Mercedes-Benz suggest 7.2 seconds is the potential timing for a 0 to 100 km/h dash. That's better than I would have imagined, bearing in mind that the 'go' department operates from a 1.8 litre engine. So, as you can see, the movement factor can be quite satisfying and, as such, it won't let you down as you run your urban errands. Let me say, firstly, that there is a unique feature to the front seat belts in this car. Click on your belt (upfront) and an invisible force will grab you tight and lock in you into position. Let me tell you ..... I like that! It's a good feeling. And the seats are comfy with very supportive bolsters. The seat belts themselves are striking in appearance. Some folks may believe the red belts are a belt too far (so to speak) but I liked the very effective contrast. The red stitching inside the car was quite attractive. 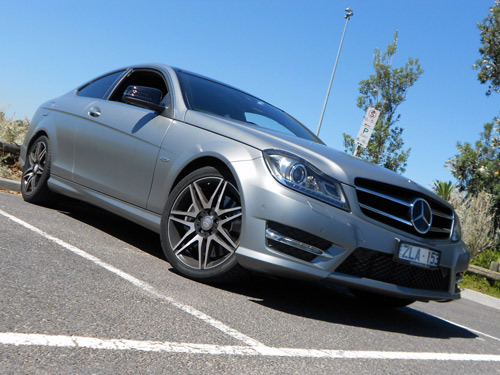 Optioning up the C 250 Sport Coupe makes sense when you get around a bit. And certainly we found the upgrading of the interior as part of the AMGing of the package a good move. The rear seat was better for average sized adults than I first imagined from a space perspective. But it wasn't all that comfortable sitting in the back. Elbow space is one area for improvement. Easy for kids, but more testing for grown-ups, the entry and egress required concentration to ensure it went smoothly (without a fall). The reversing camera made parking in tight spaces an easy task. The rear-wheel drive C 250 Sport Coupe has a 1,796cc, 4-cylinder engine featuring 150 kW of power (at 5,500rpm) and 310 Nm of torque (at 2,300–4,300rpm). Direct-injection and turbocharging are a feature, hence the on-road performance is better than one may suspect. The transmission is a seven-speed automatic. Known as 7G-Tronic it features multiple settings. Comfortable or sporty: a switch in the centre console can be used to select one of two drive programmes: "E" (Economy) or "S" (Sport). Mercedes-Benz is one car manufacturer that certainly goes the distance to ensure their cars are equipped with highly regarded safety aspects. There's air bags all around in the coupe and a knee-bag for the driver too. ESP is standard, as you would expect. Multiple assist system come standard to assist the driver, but safe driving practices are always a good idea too. Mercedes-Benz seem to be continually devising wonderful support system in respect to vehicle safety. I wonder what they will come up with next! The C250 requires 95RON premium petrol. On the combined cycle, fuel consumption of the C 250 Sport Coupe is rated at 7.0 litres per 100 kms. The fuel tank capacity is 59 litres. CO2 emission rating comes in at 160 grammes/kilometre. 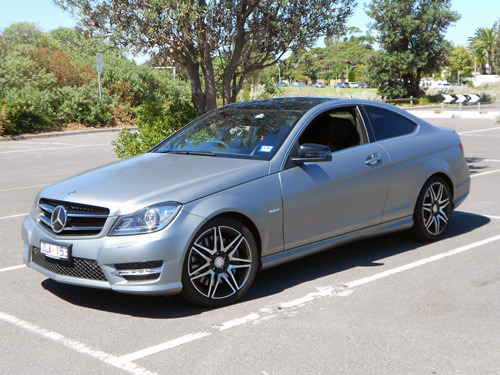 The C 250 Sport Coupe includes the AMG Sports Package PLUS pack (includes AMG 7-twin-spoke light-alloy wheels; an AMG spoiler lip; sports seats in ARTICO man-made fake-leather/DINAMICA; red seat belts and red contrasting stitching on the steering wheel, seats, door centre panels, door armrests, centre console and shift lever gaiter; black exterior mirrors; AMG sports suspension with spring and damper set-up for optimised lateral dynamics plus modified camber and bearings; Sports braking system with larger brake discs; Speed-sensitive sports steering with more direct ratio; Sports exhaust system, with sound generator; Engine management with more responsive accelerator mapping; More sporty transmission configuration in S and M mode, with shorter shift times, double-declutch function and active downshift when braking). The optional Vision Package has Harman Kardon® Logic 7® surround sound system (includes Dolby Digital and DTS when combined with COMAND APS; Panoramic glass sunroof with tilt/slide, electrically operated with convenience closing function; Intelligent Light System with Bi-Xenon headlamps; Active Light System; variable light distribution, headlamp cleaning). The Driving Assistance Package PLUS (includes Distronic Plus proximity control, Pre-Safe® Brake, BAS PLUS Brake Assist, Active Lane Keeping Assist and Active Blind Spot Assist systems). An excellent package in my opinion. The Comfort Package includes Memory seats, fully electrically adjustable; Heated seats; Keyless-Go access and drive authorisation system including door handles with chrome inserts. Another worthwhile package. Whilst the Mercedes-Benz option system may seem a little complex at first, it is really quite simple. And it's a good way to spend more money than you may have originally planned. My prediction is that the day will come when there are fewer option packs on offer. For example, there are cars on the market in the $30s with electronically operated parking brakes. Yet the C 250 still has the manually operated foot pedal (with under dash hand-operated release) which has now reached its 'use by date'. Mercedes-Benz covers the C-Class coupe with a warranty for 3 years (unlimited kilometres), with conditions (of course). 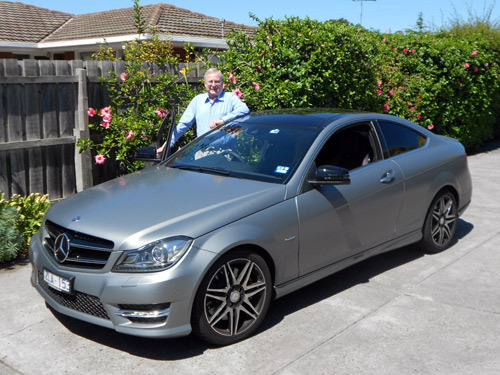 It's not an AMG, but it is inspired by the AMG lineage, so the Mercedes-Benz C 250 Sport Coupe has the credentials that will suit many a buyer. Yet, at almost $100,000* we wonder if this very attractive 'looker' offers value. But, be assured, there's nothing wrong with getting about in this little number as it comes with a high feel good factor. More Mercedes-Benz News ..... here.